Done for The Book of Night, Perseid Publishing, this particular piece was an illustration for the poem Vice Versaby Ambrose Bierce. The poem describes a woman who marries a soldier who was already dead in order to secure his pension. 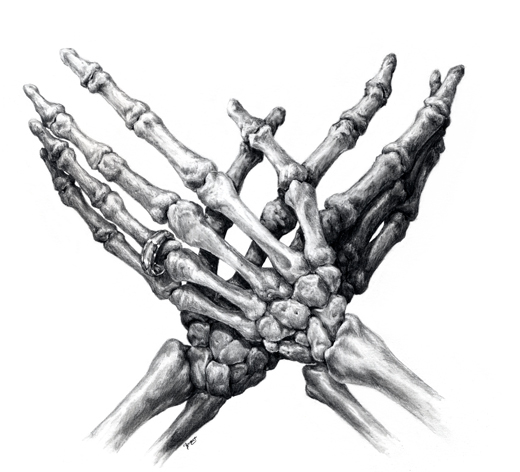 While in the poem he was only dead a mere nine hours, I thought of a great visual for a pair of skeletal hands, crossed in repose, with the wedding band still hanging around the finger. Depending on how you want to look at it, it either talks about how even in death, you can’t escape the “bonds” of marriage, or even in death the bonds of marriage still survives. Two sides of the same coin, eh?